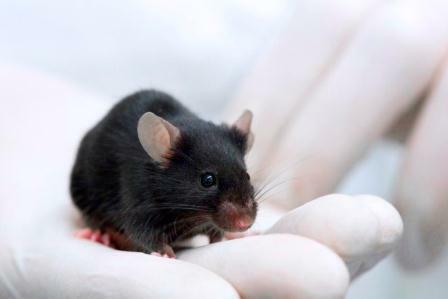 The detection system developed by BioExplorers is based on the use of mice as superior biosensors, which provide exceedingly accurate, specific and reliable results quickly, with a near zero false alarm rate, and using no radiation. The company's team of experts in animal behavior has developed an innovative computerized and automated method that complies with Animal Welfare Act requirements for training the biosensors to detect numerous, diverse target substances – from different types of explosive materials to a variety of narcotics, agricultural products, spoiled food, disease markers and more. Rigorous quality assurance protocols are then implemented to ensure performance that will consistently and reliably provide optimal results. The mice are bred in an SPF (specific pathogen free) facility, and are kept in lab conditions that exceed NIH requirements. They are kept in cartridges housing 4-8 mice each – depending on the application. The cartridges hold high quality bedding, as well as all the food and water the mice require for a 14-day period. They are replaced within minutes with fresh ones every two weeks by service personnel, to allow uninterrupted, 24/7 operation. The biosensors remain hidden from view and do not come into contact with screened individuals or other persons in the system's vicinity at any time. Moreover, the air always flows only from the screened individuals to the biosensors, and never in the opposite direction. Additionally, the air flowing from the cartridge is filtered through charcoal and HEPA filters before being directed away. In fact, persons undergoing screening remain unaware of the type of sensors used by the detection system unless specifically told. Although the mice's olfactory receptors are constantly primed to detect the odors of specific target substances, the "operational" cartridge is exchanged every 4 hours with another cartridge to ensure peak performance of the biosensors, allowing the system to continue providing unfailingly accurate results around the clock. In objective tests, BioExplorers' system succeeded to detect a variety of explosive materials where the most advanced technological systems in use today have failed. Sniffers that came into direct contact with a package containing explosives did not detect their presence, whereas these were later identified by the BioExplorers system, even when concealed under clothing. 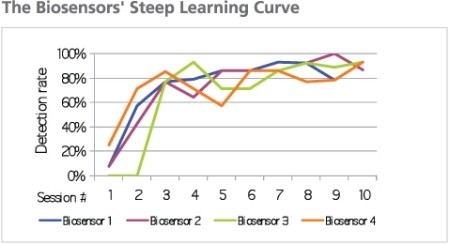 This exceptional level of detection is achieved not only thanks to each individual biosensors' hypersensitivity, but also to the fact that multiple biosensors sample the air concurrently, allowing the system to reach a higher, compounded level of accuracy. BioExplorers' patented system comprises several cartridges containing multiple biosensors each, arranged in a vertical column, with the biosensors hidden from view. The number of biosensors in each cartridge, and the number of cartridges in the system are determined depending on the application. The system structure is determined as a function of the application – whether gate-like, for screening individuals (with three cartridges), a mobile system for screening cargo, etc. The biosensors can be trained to detect virtually any substance based on its odor within a few short days, in an automated, methodical process patented by BioExplorers, which includes strict quality control mechanisms. 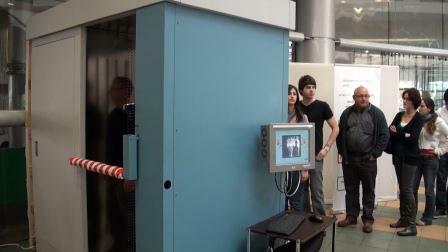 They achieve a detection rate of 90% after only 10 sessions. The same biosensors can be trained to detect many different odors. Every 4 hours the cartridge housing the group of biosensors that has been "on duty" is automatically and instantaneously switched with another cartridge of biosensors included in the system, and remains "off duty" for 8 hours. No human contact is required to switch the cartridges, and the system continues operating within seconds. All the cartridges are replaced every 14 days with fresh ones, which include trained biosensors and all the food, water and special high quality bedding they require for the subsequent 14 day period. The cartridges are delivered and replaced by service personnel within minutes. One operator per shift is sufficient to supervise and control 5-10 systems. The operators require only basic, inexpensive training, as opposed to the more lengthy and costly training required for operators of technological detection systems, which must include image analysis skills. Furthermore, the BioExplorers detection system does not require the operator's intervention to determine whether a target substance has been detected – it does so automatically. Consequently, detection accuracy and reliability remain consistently high, as opposed to results provided by technological systems requiring human intervention, whose operators' level of alertness is diminished when working long shifts. Air flows from the screened individual or object to a cartridge housing the hypersensitive biosensors. Upon exposure to the air flowing from the individual or object, all the biosensors sample it concurrently and individually (as opposed to one biosensor, in the case of canines). Screening is quick – a mere 6-8 seconds per person or object – ensuring high throughput. The air flowing from the biosensors cartridge is filtered through charcoal and HEPA filters before being directed away. If the biosensors detect a target substance, they dart to a reporting position. The indication given by the group of biosensors is analyzed by sophisticated, proprietary algorithms developed by BioExplorers' team, and is then translated into an electronic signal, which the system displays as a simple "yes" or "no" response: visibly – with red lights blinking, as well as audibly – with an alarm. Near perfect probability of detection (PD) – higher than of all currently available technological systems and K9 teams. Near zero false alarm rate – the system provides results at an exceptional level of reliability. High throughput – 6-8 seconds per screened individual or object, without compromising on the level of accuracy, to ensure minimal delay and impact on customer service. Exceptional specificity – the biosensors are trained to detect specific substances – for example, distinguish explosive materials from substances that have a similar smell. Consistently superior level of performance – the biosensors utilize their olfactory skills as a part of their routine existence; they continue to provide the same accurate results without requiring frequent rest periods or motivation building, as opposed to canines, who can only detect target materials effectively for short periods of approximately 30 minutes at a time. Virtually limitless range of target substances, with new substances added within days. The same biosensors can be trained to detect numerous specific substances. Broad range of applications – the ability to train the biosensors to detect any odor emitting substance – even at the vapor level, along with the flexibility of the system's configuration, its high throughput and low operational cost – ensure it is ideal for numerous and diverse applications. Uninterrupted duty cycle – the system is designed to allow ongoing operation, with the biosensors "on duty" being replaced every 4 hours in an automated, mechanized manner requiring no human intervention. No radiation – no adverse effect on the screened individuals' health, coupled with respect of their privacy, as opposed to presently used full-body scanners. 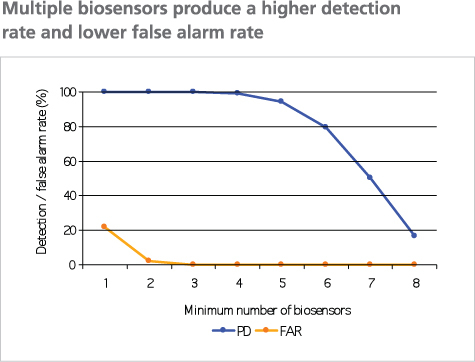 Low cost – the biosensors' training period for each target substance is mere days, system operators require minimal training, and one operator per shift is sufficient to monitor 5-10 detection systems. 24/7 operation also contributes to quick ROI.